Judging from the answers written on the board, there are plenty of music genres floating around our office. Like most modern offices, headphones and earbuds are a common sight at the MoSys office. The whiteboard question made each of us stop and consider what our coworkers were listening to during the workday. 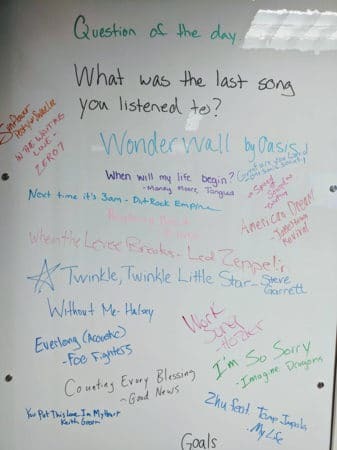 #WorkplaceWhiteboard at Motivating Systems: What was the last song you listened to? Some workplaces make music a central part of the work environment. For many retail establishments, the tempo, volume, and genre of ambient music can help to drive sales. In restaurants, it can enhance the dining experience as well as speed the turning of tables for more meals sold and greater profit. But what happens when it’s just you and your earbuds? Workplace Music – Distraction or Motivation? Everyone perceives music in the workplace differently. Some view it as a distraction. Others find that music helps them to focus. 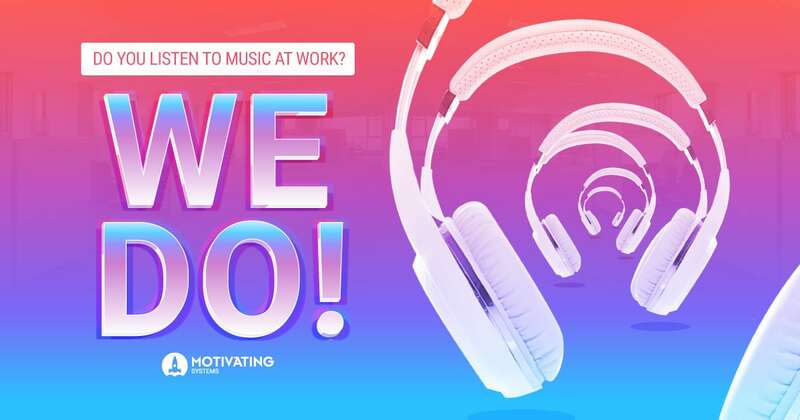 In fact, more than 80% of workers enjoy listening to music at work, and more than 70% feel it makes them more productive. Still, each person’s views on music in the workplace are a reflection of their temperament, their work environment, and their work tasks. When it comes to workplace tunes, it’s definitely not one-size-fits-all. The genre of music you listen to affects you, as well. It might not surprise you to learn that classical music helps you to focus, or that nature sounds can improve cognitive function and concentration. But what if you need to need to feel inspired and energized? Try epic music (yes, that’s a real thing) or video game music. The tempo of these genres, as well as their lack of lyrics, can help boost your mental energy. Need to be focused but relaxed? Downtempo music like smooth jazz – with or without nature sounds mixed in – can calm your body while focusing your thoughts. There are some unwritten rules, however, to listening to music at work. At the top of the list is this: whatever you’re listening to should not be a distraction to your coworkers. For those wearing headphones or earbuds, humming, singing along, or drumming can interrupt others’ focus. Those with private offices may choose to listen to music out loud but still need to be mindful of volume. Not everyone shares the same tastes in music! In many ways, Motivating Systems is like a lot of other offices. We each listen to our own preferred music genres, depending on the tasks we need to do. Many of us prefer podcasts when we’re doing repetitive tasks that don’t require deep concentration. Others have customized playlists that correspond to the variety of their job responsibilities. 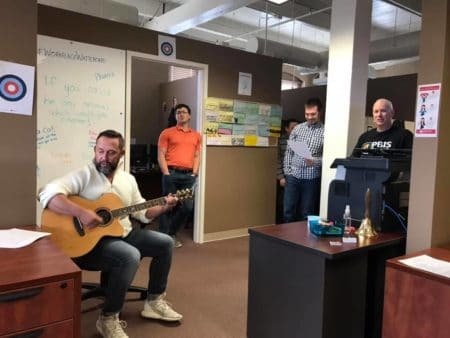 Sometimes, however, we take a break from our duties and have a live concert, right in the office. One of our Motivators, Matt, has been known to bring his guitar into the office and take requests. Sometimes it’s for a special occasion like a birthday, and sometimes it’s just because. We use our Workplace Whiteboard to list song requests, and Matt does his best to comply. We sing along, too! Music can be a powerful motivator, but it’s also highly personal. What works for one person won’t necessarily work for someone else. Still, listening to music at work can positively impact your workplace culture. It works for us at Motivating Systems! Our very own musical entertainment, Matt Hart.